Articulated pendants are set with Natural, Rubies and weighing over 7 carats each. 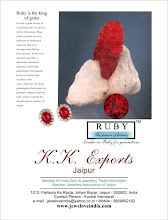 The Rubies exhibit Saturated and Homogenous color with high degree of transparency. The pair is decorated with cushion-shaped white diamonds and the top half is accented by round diamonds. The complete set is mounted in Platinum to reflect its value all the more. What do you think about this pair of Chandelier Earrings? Share your comments and reactions below. Leave a comment or email us at WeCare@TheRubyKing.com for more details on the pair.